Correction: The Associated Press erroneously summarized the results of medical studies on the use of daily low-dose aspirin to prevent a first heart attack or stroke. The studies suggest it's not worth the risks for people without known heart disease — not that risks don't outweigh benefits. The story has been updated below. Taking a low-dose aspirin every day has long been known to cut the chances of another heart attack, stroke or other heart problem in people who already have had one, but the risks aren't worth it for most other folks, major new research finds. Although it's been used for more than a century, aspirin's value in many situations is still unclear. The latest studies are some of the largest and longest to test this pennies-a-day blood thinner in people who don't yet have heart disease or a blood vessel-related problem. One found that aspirin did not help prevent first strokes or heart attacks in people at moderate risk for one because they had several health threats such as smoking, high blood pressure or high cholesterol. Another tested aspirin in people with diabetes, who are more likely to develop or die from heart problems, and found that the modest benefit it gave was offset by a greater risk of serious bleeding. Aspirin did not help prevent cancer as had been hoped. And fish oil supplements, also tested in the study of people with diabetes, failed to help. "There's been a lot of uncertainty among doctors around the world about prescribing aspirin" beyond those for whom it's now recommended, said one study leader, Dr. Jane Armitage of the University of Oxford in England. "If you're healthy, it's probably not worth taking it." The research was discussed Sunday at the European Society of Cardiology meeting in Munich. The aspirin studies used 100 milligrams a day, more than the 81-milligram pills commonly sold in the United States but still considered low dose. Adult strength is 325 milligrams. 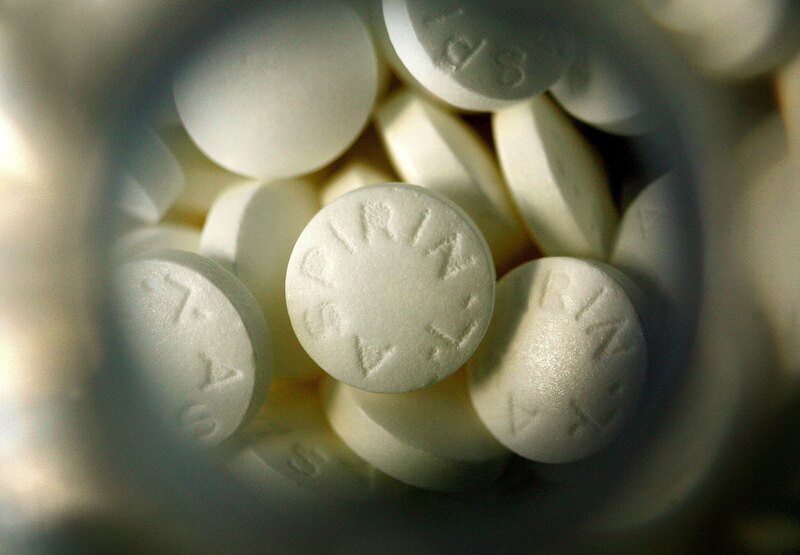 A Boston-led study gave aspirin or dummy pills to 12,546 people who were thought to have a moderate risk of suffering a heart attack or stroke within a decade because of other health issues. After five years, 4 percent of each group had suffered a heart problem — far fewer than expected, suggesting these people were actually at low risk, not moderate. Other medicines they were taking to lower blood pressure and cholesterol may have cut their heart risk so much that aspirin had little chance of helping more, said the study leader, Dr. J. Michael Gaziano of Brigham and Women's Hospital. One percent of aspirin takers had stomach or intestinal bleeding, mostly mild— twice as many as those on dummy pills. Aspirin users also had more nosebleeds, indigestion, reflux or belly pain. Bayer sponsored the study, and many researchers consult for the aspirin maker. Results were published by the journal Lancet. People with diabetes have a higher risk of heart problems and strokes from a blood clot, but also a higher risk of bleeding. Guidelines vary on which of them should consider aspirin. Oxford researchers randomly assigned 15,480 adults with Type 1 or 2 diabetes but otherwise in good health and with no history of heart problems to take either aspirin, 1 gram of fish oil, both substances, or dummy pills every day. After seven and a half years, there were fewer heart problems among aspirin users but more cases of serious bleeding, so they largely traded one risk for another. The same study also tested omega-3 fatty acids, the good oils found in salmon, tuna and other fish. Supplement takers fared no better than those given dummy capsules — 9 percent of each group suffered a heart problem. "We feel very confident that there doesn't seem to be a role for fish oil supplements for preventing heart disease," said study leader Dr. Louise Bowman of the University of Oxford. The British Heart Foundation was the study's main sponsor. Bayer and Mylan provided aspirin and fish oil, respectively. Results were published by the New England Journal of Medicine. Other studies are testing different amounts and prescription versions of fish oil, "but I can't tell people go spend your money on it; we think it's probably better to eat fish," said Dr. Holly Andersen, a heart disease prevention specialist at New York-Presbyterian/Weill Cornell who was not involved in the study. The new research doesn't alter guidelines on aspirin or fish oil, said Dr. Nieca Goldberg, a cardiologist at NYU Langone Medical Center and an American Heart Association spokeswoman. They recommend fish oil only for certain heart failure patients and say it's reasonable to consider for people who have already suffered a heart attack.